Magmagical Journey! is a multiplayer Bowser Minigame in Mario Party 7. Its name comes from "magical journey" and "magma". 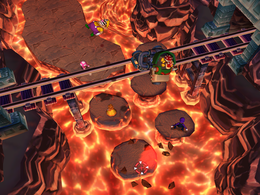 The four players find themselves before a large river of lava with no way to cross except by means of several rocks sticking out. Their goal is to reach Bowser on the other side of the river. While crossing, the player also must make sure to avoid touching the lava or being hit by a projectile fired by a Koopa Kid, as either will cause the player to lose. Rules – "Hop across the rocks to reach the goal, but watch for the attacks of the Koopa Kids!" Advice – "The rocks will eventually sink into the lava, so keep moving!" German Magmania Portmanteau of "magma" and "mania". This page was last edited on August 8, 2017, at 12:33.